Every Portlander’s dream-garden: a big bed of healthy kale plants! Between harvesting a bounty of hot-weather veggies and summer vacations, it’s hard to focus on planning fall and winter crops. But now is the time to do it. Don’t worry if you missed the mid-July window for sowing seed of winter vegetables like cabbage and broccoli: local plant nurseries were a step ahead of you, and are brimming with healthy starts that you can plant in the ground from now through the end of the month. 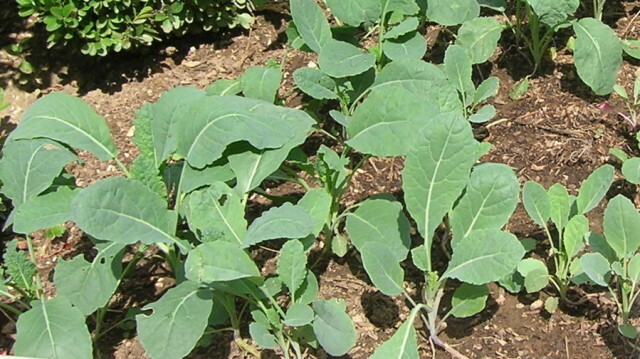 It costs a little more to buy starts than to grow from seed, but harvesting your own kale, cabbage, broccoli and Brussels sprouts this fall and winter will more than compensate. If you haven’t already, head over to the nursery and pick up your seeds and starts – and some mushroom or planting compost if you don’t have any home-made garden compost. Unless you’re planting real acreage, you can probably get the prep and planting of a smallish garden plot done in an hour or so. You’ll notice that there are variations between the charts… some are more strict about what you can plant than others. Just know that, while most of these charts give specific windows of time during which you can plant from seed in our region, every garden is different. And every gardener is different, too. What works for your neighbor might not work for you unless you water like she does, or you have the same light exposure. So, adopt an experimental frame of mind and give it a try! Before planting starts, amend your soil with garden compost (if you use a bagged manure-based product, mix it thoroughly into existing soil). Keep new starts well watered – never let them dry out! – and mulch with straw, grass clippings or compost to help retain soil moisture.